Employing a new technology of using fish oil, or Omega-3, as a coating, Atrium C-Qur hernia mesh was marketed as preventing the side effects commonly associated with other hernia mesh products. However, despite the claim of safety, dozens of lawsuits have been filed, alleging that serious complications have arisen because of this version of hernia mesh’s coating. The Boston hernia mesh lawyers at the Naumes Law Group can help file claims on behalf of people injured by an Atrium C-Qur hernia mesh product. When a defective medical device is released with deceptive warranties, patients harmed by the device have the legal right to hold manufacturers responsible. Offering individualized attention to each of our clients, our product liability attorneys are dedicated to ensuring that victims know their rights and assert them throughout each phase of the litigation. Atrium Medical Corporation manufactures and sells various types of C-Qur mesh to be used in surgeries to treat hernias. This type of hernia mesh employs the use of Omega-3 fatty acid to coat the patch or plug to act as an adhesion barrier. In 2005, the Food and Drug Administration (FDA) allowed C-Qur mesh to enter the market without clinical trials, which are usually required for a new medical device to ensure its safety. Atrium claimed that its C-Qur product should be considered equivalent to other kinds of hernia mesh that were already tested and on the market. However, C-Qur was the first and only type of hernia mesh to use a fish oil coating. Atrium alleged that this fish oil would provide anti-inflammatory benefits to prevent adhesions, or scar tissue, from forming during recovery, which may cause organs to stick together—a source of complications for other oil-coated mesh in the past. Despite Atrium’s claims of safety, reports of adhesions related to the use of C-Qur Mesh have occurred. Additionally, other serious side effects have also been reported, including severe pain, inflammation, abdominal abscesses, and allergic reactions. 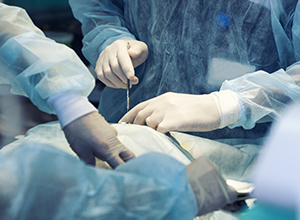 Surgeons who have treated the infections and complications following the implantation of C-Qur mesh have described conditions in which the removed mesh was found bunched or balled up inside a patient’s body. In 2013, over 100,000 C-Qur mesh products were recalled, due to the fish oil coating’s potential to peel and stick to packaging when exposed to humid and hot conditions. Additionally, the FDA has issued citations against Atrium for disregarding reports of infections and product quality defects. Our hernia mesh attorneys can help Boston residents who have developed infections because of these defects. If you have suffered from a serious complication or side effect after being implanted with a C-Qur mesh product, you may have a claim against the manufacturer based on product liability. Defects occur when a product has an unreasonable likelihood of causing harm to consumers, due to a flaw in its design or manufacture. Manufacturers may be held strictly liable for any harm that their defective products cause. Many claims are being pursued against Atrium, alleging that it is responsible for the harm associated with its C-Qur hernia mesh. Victims who have sustained injuries due to these products may be entitled to damages for medical costs as well as pain and suffering. Timing is important to make sure that evidence is preserved and collected, since Massachusetts gives victims only three years from the date of an injury to pursue these claims. If you need help pursuing legal action against a culpable manufacturer, the Boston hernia mesh attorneys at the Naumes Law Group can offer dedicated and seasoned representation for your product liability claim. Our firm assists people in Springfield, Worcester, Waltham, Watertown, Hyannis, Malden, Medford, Taunton, Peabody, Braintree, Weymouth, Quincy, Pittsfield, and Plymouth, in addition to other areas of Suffolk, Middlesex, Barnstable, Berkshire, Bristol, Essex, Franklin, Hampden, Hampshire, Norfolk, Plymouth, and Worcester Counties. Call our office today at 844-826-8445 or 618-227-8444, or contact us online for a free appointment to discuss your case.